How Much Has Government Spending Helped Private Sector GDP Since the 2007 Financial Crisis? News of the economic contraction last quarter — albeit a very small one — is disturbing to the American people. The recovery itself has been less than stellar, with GDP growth below the historical average. Many pundits will dedicate entire segments of their programs to asking the question "What should the government do to help the economy?" After all, after the near trillion dollar stimulus in 2009 and subsequent trillion-dollar-plus deficits we see now, GDP has ostensibly grown. But does overall GDP really tell us the state of the economy? Aggregate GDP growth alone has never been a reliable indicator of growth. It doesn&apos;t necessarily present a very accurate picture of the state of our economy. An example of this would be the post-war recession that largely resulted from the demilitarization and demobilization of our nation. 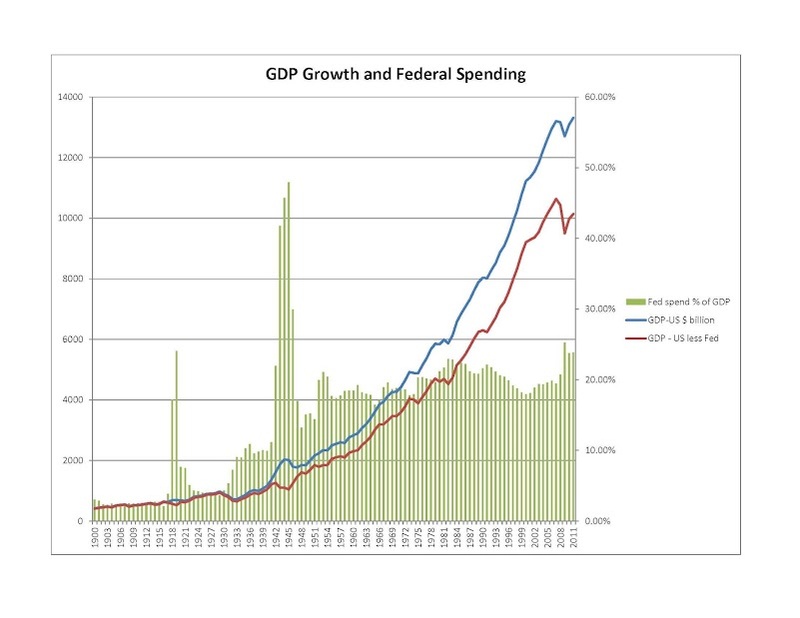 This chart seperates the share of GDP: the blue line is total GDP, and the red line is GDP minus federal spending. Total GDP decreased during our demobilizations years, but non-federal GDP actually grew during this period, which suggests strong private sector growth. Theories abound on why there was such a divergence, but there is no debate between Keynesian and Austrian economists today that private sector growth is the primary driver of a nation’s economy. Since this is the case, shouldn’t we simply look at private sector GDP growth and ignore government’s portion of our economy when examinng the efficacy of the stimulus? It is very difficult to gauge how much government activities actually result in real, sustainable growth. While it is a stretch to say that government produces nothing, (for example, national parks are a revenue generator for the federal government) non-tax income constitutes an almost negligible portion of federal revenues. Additionally, there is the added difficulty on putting a price tag on some of the other items such as national defense. Keeping the nation conflict free certainly helps the economy. However, defense and other government roles such as law enforcement are facilitators, not drivers, of economic production. There is no way to accurately put a price tag on these items of government, and as such, they are not self-sustaining. They depend on tax revenues. Without tax revenues, these services would cease to exist in any meaningful form. There are other reasons why we shouldn&apos;t factor in government-driven GDP, but these are the two big ones. With this in mind, the answer to whether or not the stimulus was succesful now depends on how private sector GDP has performed since the stimulus was enacted. All my data was collected from USgovernmentspending.com and the data can be downloaded from my box page for independent analysis. Nominal private sector GDP peaked in 2007 at just over $9 trillion, a 64% share of our total economic output. The Great Recession saw private sector GDP drop to 57%, or just under $8 trillion, over the following two years. The crisis was the impetus for our government spending to increase by over a trillion dollars since 2007. From 2008 to 2011, when private sector GDP finally exceeded its 2008 high, total national debt grew by over $5.1 trillion in 3 years. 4.7 trillion of that total was from the federal government. That same year, the share of the economy in the private sector has declined by 4% overall. Currently, the data doesn’t bode well for the stimulus, but what happens when we take out inflation and normalize the data? Adjusting our GDP to constant 2005 dollars, we see that private sector GDP topped in 2007 at $8.5 trillion. To date, private sector GDP still hasn’t reached its pre-recession heights, and will not until the end of 2013 — if the estimates I have put together are correct. This means that the government will have spent, in real dollars, near six trillion and increased our national debt by 52% over the course of six years; and it still hasn’t returned the country to the economic shape it was before the recession in real terms. This raises serious questions about the ability of government to foster economic growth during times of crisis. Part of the justification for increased government involvement was its ability to smooth out the economic cycle and make recessions less severe. However, while the last two recession and recovery cycles saw smaller drops in overall employment, the recession and recovery cycles prior to 1990 were far shorter. This current recession breaks the mold, as it is both sharper and longer than any recession in the last 30 years when it comes to employment. This could be indicative that the system that once worked has fundamentally broken down, because despite the actions of both the Federal Reserve and our government, our economy is arguably still worse off than it was in 2007. At this point, our real debt has increased by $6 trillion, and our debt in real terms will be 123% of our estimated GDP at the end of 2013. Our government hasn’t even finalized our budget for 2013 (even though we are over a month into the new year), and the total estimated government expenditures from the White House for 2013 yield a $900 billion deficit. The stated goal of our government when implementing its increased spending was to get people back to work, which would stimulate the economy; yet U-6 unemployment is still intolerably high and real productive GDP is still below pre-recessionary highs. If the government&apos;s intent was to bolster private sector GDP and spur real economic growth, which largely comes from the private sector — then based off of an analysis of real private sector GDP growth, it has failed. One can argue that the recession would have been worse without the government, but that is a non-factual. Ultimately, results trump intentions or hypothetical possibilities, and the results are simply not good. Two presidents, trillions of dollars, and six years later, we are no better off than we were before.